AVAILABLE in print in my eStore (personal signed copies available), Amazon, Booksamillion.com, and Barnes & Noble.com, to name a few. AVAILABLE for Kindle eBook, Barnes & Noble Nook, Apple iBooks, and/or your favorite eBook platform. Get your copy Now through your favorite book place! *Note: The Kindle e-book version is only available to be signed through Authorgraph.com! "Like multitudes before her, Scheidemann records her thoughts on love, nature and revelations about adulthood. Unlike many others, however, she infuses these musings with a streak of poetry..."
Seasonal Lives Poetry Collection: With Me is a collection of Poetry about love, life, seasons, situations, myths, food, etc. 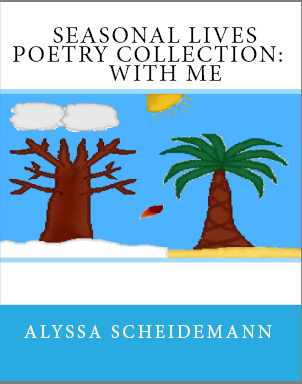 It's a general poetry book for all ages with a relatable poem for anyone. The poetry progresses through the changes of growing up to follow a path of confidence. From inspirational poems to fun poems, it's especially great as a gift, especially for the holidays.